I realize that not everyone feels this joy today. Not everyone is celebrating the resurrection.. some don’t believe, some are too tired, some are alone and feeling that loneliness… some are suffering through other hardships that make celebration difficult. Which makes the day even more painful–that so many are celebrating, and yet joy is hard to muster up in the midst of some circumstances. I realize that Easter doesn’t solve all the problems of the world. Far from it. Things still go wrong, awfully wrong, all the time. Life can be so challenging and frustrating and all sorts of … “ing”s. I realize that tomorrow is Monday, work begins again, the same to-do lists we had sitting on our desks and dining room tables and other flat spaces in homes.. these to-do lists will still be there. 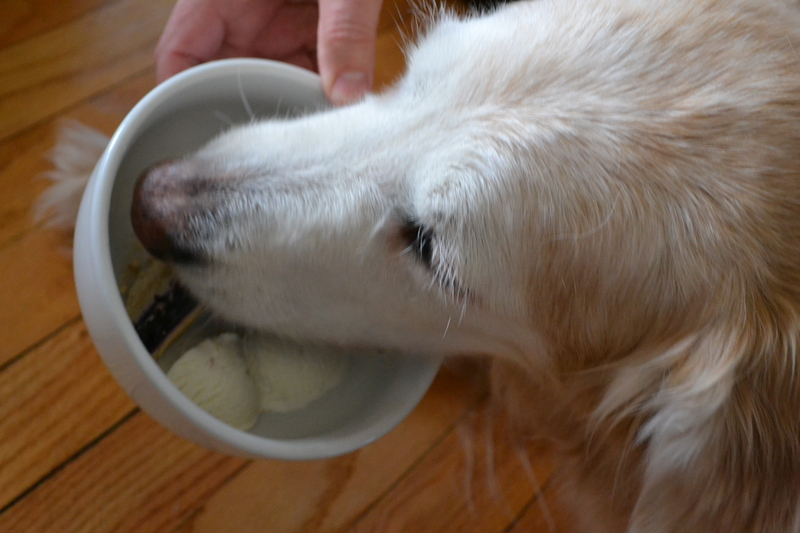 And no amount of peanut butter eggs, or lasagna, or ham, or turkey, or whatever… will do the work for us. No matter how creative our dyed eggs are–or aren’t–stuff is waiting for us tomorrow. And even today. And I realize that in all these situations and in every situation, God is still good. Christ has still risen. And my hope and prayer today is that I, and you, can reflect the joy of knowing the risen Lord, whether we feel joyful or not. May the Easter Joy bring you strength and peace today, and every day. Just a photo for Wednesday. That’s it. 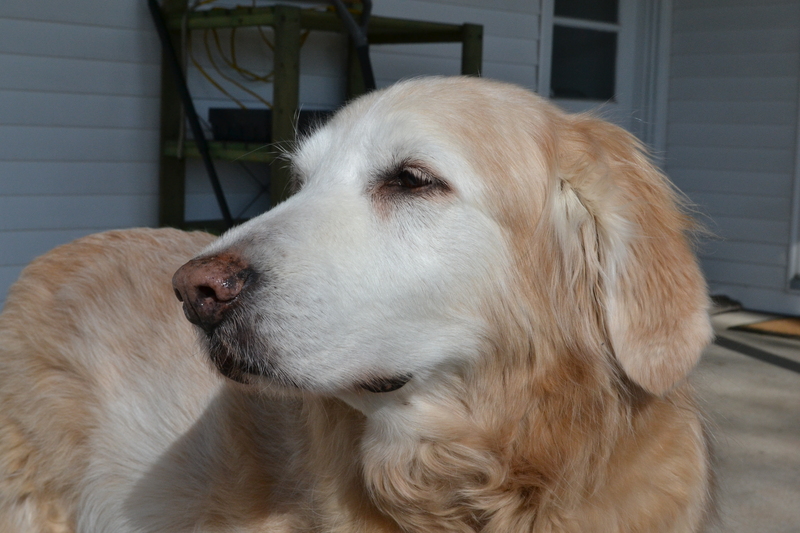 A photo of our aging puppy. Aging, but still beautiful. Well, frankly, there’s not much I can think of to say about this photo, spiritually-thinking… I took it for some reason. But, as has happened before, I’m blanking on why that was. 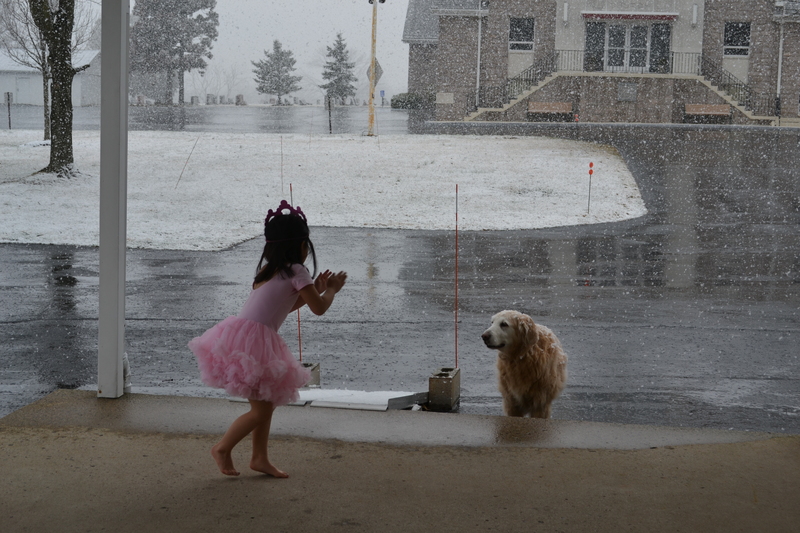 So, for now, it’s just a photo of Kajsa dressed in a princess/dance outfit, trying to get Abby to come up the ramp instead of barking for me to go lift her up onto the porch. 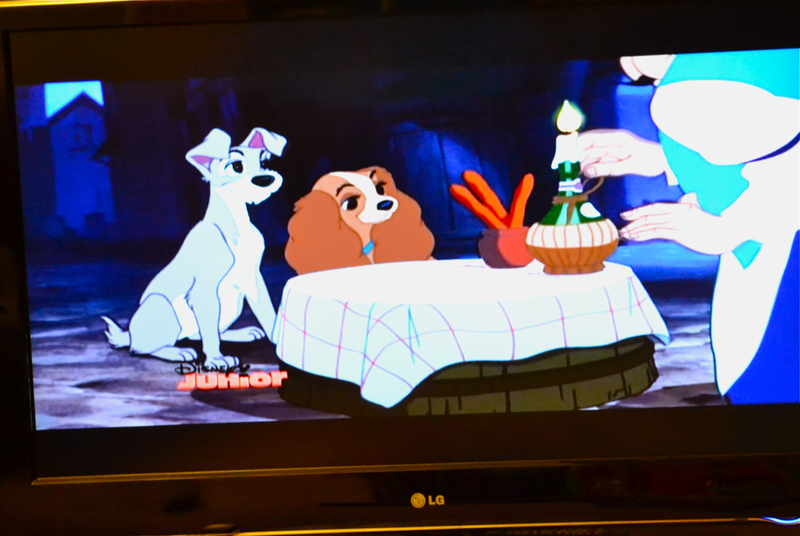 Last night, Kajsa, Jim and I watched “Lady and the Tramp”, the 1955 version. I had never seen it, amazingly. I thought I had, but apparently I had just learned a song (“We are Siamese if you pleeease…”), and seen a clip here and there–such as the spaghetti noodle clip. Thinking I’d seen the movie and seeing the movie are two different things. Though it is a stretch, I did find myself thinking about the prodigal son from this morning’s Luke 15 gospel text, and “Tramp”, the dog who is a free spirit, not wanting to be tied down to anyone or anything…. and yet has incredibly redeeming characteristics. A different kind of prodigal. 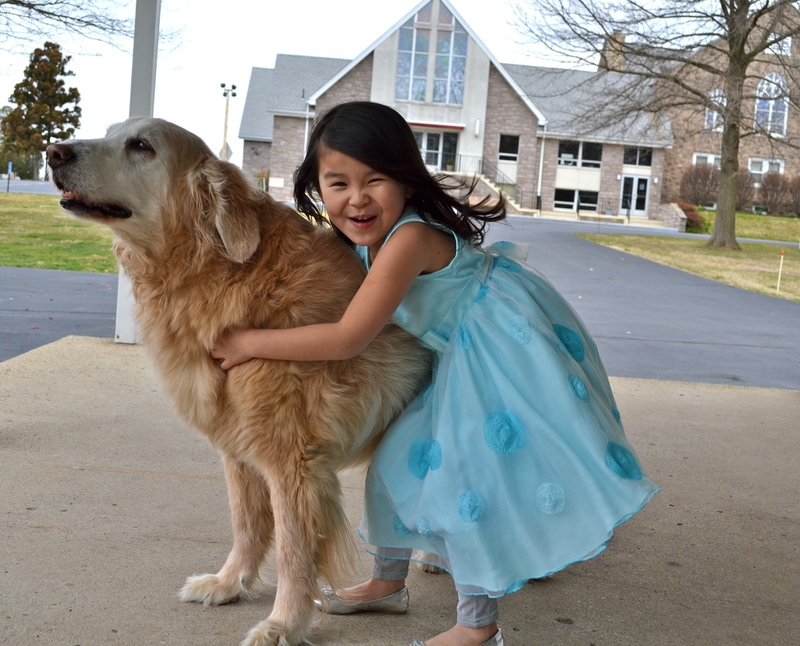 Kajsa and her cousin having fun Easter weekend…..
Day 33: Lazarus is alive?! The John 11 passage about a loved one being resurrected is challenging. It challenges our sense of fairness, of miracles, of why some bad things are fixed for some people, and many bad things aren’t fixed for many people.. but at the end of the week, I can see the joy and the shock of the resurrection. The questions will still challenge. The problems won’t go away, some days will be joyous, some won’t. For us, for those we love, and for those we don’t even know, but who continue to struggle through life… But through it all, God is still present. And for now, Lazarus is alive?! Abby, at least, will jump for joy!